One last post on last year's London adventures with some photos that fell through the cracks. While I have been fortunate enough to travel all over the world, I had never stepped foot in the United Kingdom before. I always wanted to go to more 'exotic' places, but I can't overstate just how wonderful living in London was. Well technically, KLS' tells me that we were living in Greenwich, near a wonderful park and with easy access to London. The diversity, the ease of getting around without a car, the beautiful countryside, the local culture, and so much more made it such a great city for us. Given the chance to live in that fabulous flat along the Thames and take a ferry to work on the company dollar again, we'd move back to Greenwich in a heartbeat. We definitely shared some of our favorite experiences while living there. On the flip side, KLS said living in central London was too noisy and the sheer number of people was overwhelming. She was miserable there. The expat that we had inherited the flat in Greenwich from had moved there from the same residence in central London as KLS . Before he found the flat, he was looking for ways to get himself deported to get out of his employment contract with no penalties because he was struggling with big city living. I guess it just depends on your day to day set up. The National Portrait gallery beside Trafalgar Square on a rare sunny day. This might be a photo of the National Portrait gallery on a sunny day, but it is actually a photo of the Clockwork Lion's bum made out of clockwork machinery. A close up of the Clockwork Lion, a temporary animatronic lion in Trafalgar Square that is meant to draw attention to the countdown to the actual cats' extinction. White Hall Gardens where KLS and I shared a few wonderful lunches along the Thames River. The building in the background is One Whitehall Place at the Royal Horseguards Hotel, which was the first building in London to be fully illuminated with electrical lighting. A clever way to collect money from passerbys while building elaborate sand structures along the Thames. This luxury tree house was built along the South Bank as part of a contest and advertisement to get people to vacation in African countries. A view from the South Bank. KLS' after work pub carried beer that is brewed in Steven's Point, WI, just 15 minutes from my mom's house in central Wisconsin. As Americans, we might still have a lot to learn from the British. The leftovers of KLS' amazing Spanish jamon (ham) party. This one is for my sister who can call her dog with the big crinkle a chip bag makes. 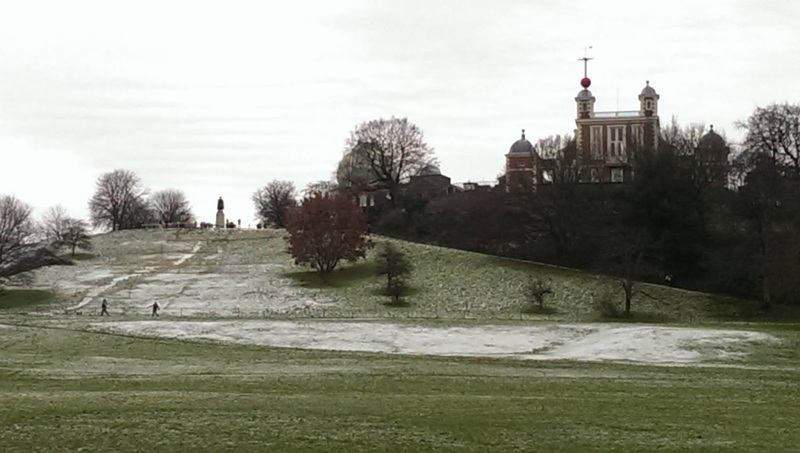 This dusting of snow in Greenwich Park in front of the Royal Observatory before ultimate frisbee pickup is the only snow that I saw in London all winter. All Saints' Church in Blackheath. At the start of our stay, KLS and I would take a local train to a regional train to get to the market. By the end of our stay, we learned, we could just want 1.5 miles through Greenwich Park to the same market. Maps are your friends. The view over London from the Royal Observatory - central London on the left and Canary Wharf on the right. You can see the top of our apartment building on the left side of the picture on the near side of the Thames. The best cake that KLS and I had on our visit to London. Yum, yum, yum! The very end result of opening a wine bottle by placing it in a shoe and smacking the base flatly off a hard surface (about 25-40 times). Just a few more photos from KLS' and my time living in London last winter. This trip to Dover started like so many of our adventures. We woke up way too early, hopped the first tube of the morning to hop a train to show up early for a full day of exploring. This was one of my favorite train rides because of Bill Bryson's book about his humorous travels in England. The white cliffs hover right over parts of town along the water. Once we got to Dover, we ambled down to the water. On our way over to the white cliffs, KLS found this formula. She did not solve it. Dover is a major commerce link to Calais, France and mainland Europe. In addition to moving goods for sale, they run up to 48 ferries per day across the 20.6 mile wide English Channel. If you zoom in on the photo, you can just make out France in the distance. The busy port of Dover. Our wet, muddy, windy, wonderful walk toward the white cliffs just outside of town. I am only including a picture of the NAAFI restaurant because I tried to hold a Pitt Endowment meeting from this location. Technically, I tried to hold it from inside the building because it was so cold out. The portable wireless device was no match for that stone work. I ended up moving to the bench in front of the structure that is cut off on the left side. These were the last walls we needed to breach while storming the castle to reach the Great Tower. Dining Room inside the Great Tower of Dover Castle. Cooking inside the Great Tower of Dover Castle. Unlike most of the castles I have visited, Dover Castle was used in in the past 100 hundred years. During World War II, they used three miles of secret tunnels as a hospital and military command center. Good food along the water made for a great wind down to a long, active day before catching the train home. Europe is small. Hopping between countries is like scooting between medium sized states in the USA (but with 3-4 times the population). On top of that, Morocco is just nine short miles across the Strait of Gibraltar from Spain. That makes it an ideal spot for a quick getaway. A plaza market in the medina, the old city in Marrakech. The central courtyard of our riad (a peaceful escape from the medina chaos). The riads were generally a central courtyard with an open air roof that was surrounded by guest rooms on 2-4 sides. The street to to our riad. Originally, KLS and I were going to go for a ten day jaunt across the entire country, but my ear infection at Christmas disagreed. We could not get refunds from our budget airline so we decided to explore one locate for a few days instead. That stop was Marrakesh, but we did not take the Marrakesh Express. There are so many oranges that people just let them fall to the ground. Medersa Ben Youssef, an Islamic College from the 14th century. The main attraction in Marrakesh is the medina - the old city. It has thick defensive walls that clearly divide it from the rest of the city. The main streets are bustling with shops, motorcycles, bicycles, carts carrying goods, and enough people that you'll never be more than three feet from someone. It will assault all of your senses. Each night, we were able to escape the chaos by returning to our lodging, a peaceful riad inside the medina. The drastic difference between walking along a shopping street and the atmosphere in our riad cannot be overstated. Chaos to calm. The riads in the medina were a little more expensive. Some of this is due to the proximity to attractions, higher quality of maintenance, and great amenities. However, I think the key piece is that after a day working your way through the crowds, fighting off scam artists, dodging motorbikes, and breathing in enough dust to wish you had a surgical mask, you just want a quiet retreat. The riad provided that in spades. While we loved exploring, we were always very happy to get home. A tannery where they turn goats into leather. KLS educating the local populace, much to the dismay of the hustler who took us to the shop. Palais de la Bahia, finished in 1900. KLS starts eating the local fruit at Palais La Bahia. After a quiet night, recuperating, we were off to see the sites. Palaces and souks (markets), then more souks and palaces. The palaces were a curious site. The buildings were ornate and fun to explore, but they were also virtually empty of anything (exhibits or even basic furniture) inside. It wasn't quite what I was used to, but neither were the prices. The 'major sites' only cost $1-2 to get in. It gave me a better appreciation of the attractions and costs in other countries to develop an engaging historical attraction. A small alleyway that I think was in the Jewish quarter. They locals make a big deal about how the Jewish section of the Medina is different, but our untrained eyes only noticed small differences. Just over the wall of the palais there was a huge pile of garbage. European White Storks make huge nests. Happy cats ate when and where they could. A souk, an old city market. On our second full day, we kept exploring on foot. We headed out to Palais El Badi, Kutubiyya Mosque, Majorelle Garden, the Jewish quarter, souks so KLS could negotiate for argan oil, and to the newer parts of the city. The Palais El Badi had groves of orange trees inside the walls. KLS went to picking again. The newer parts of Marrkesh were so different than the medina. They were peaceful. While it was definitely a Middle Eastern influenced city, you could see plenty of European elements as well. It was not dedicated to helping tourists offload their dollars and consequently a lot more peaceful. One of the highlights of the new city was the quiet Majorelle Gardens (donated by Yves Saint-Laurent and Pierre Bergé). Noticing a theme? The medina was really wearing me down. Kutubiyya Mosque at night from the rooftop of the french restaurant. Random street in the new city. Downtown Marrakesh, outside of the medina. A park with its over Dippy. Our final day was a quiet day. We woke up early, enjoyed how peaceful the medina could be before businesses were open and took in our favorite culinary treats before heading back to the airport. For KLS, this meant visiting a fried spiced bread stand near our riad and then chasing it with some fresh made orange juice. Orange juice is to Marrakesh what gelato is to Italy. This single photo is the essence of our trip. Each dirham was 10 cents so that made each amazing fresh made orange juice just 40 cents. We had SO many each day. Think gelato in Italy levels.